Regular edition of 42 handnumbered copies only. NO REPRESS. ASTHENIA n. [gr. astheneia, weakness, fr. a- priv. + sthenos, strength]. 1. The lack or loss of strength or energy ; weakness ; debility. 2. PSYCHIATRY. Lack of dynamic force in the personality. Kinds of asthenia include myalgic asthenia and neurocirculatory asthenia. See also adynamia. asthenic, adj. Each copy is personally dedicated to the buyer by the artist. C'est toujours avec un grand intérêt et un réel plaisir que je reçois les productions du label de Black Métal français Distant Voices, surtout lorsqu'il s'agit d'un projet qui m'est déjà familier à savoir un nouvel EP du groupe MISERY. Ce nouvel EP nous propose deux longs titres de plus de dix minutes : un premier aux accents vaporeux, aux cris écorchés lointains sur un lit de guitare presque shoegaze faisant penser parfois aux excellent DARKSPACE. Quant au second, il s'agit d'un morceau beaucoup plus post black métal qui met l'accent sur les mélodies avant de se dévoiler et nous délivrer une dose de black métal bien massive et bien sombre. Même si MISERY a pris quelques risques notamment en jouant des titres longs, il s'en tire très bien et à aucun moment la lassitude vient pointer le bout de son nez. Encore une fois, tout est cohérent et vachement bien construit. De naam laat reeds vermoeden dat deze Franse act geen vrolijke muziek maakt. Het credo van Misery is ‘pijn is kunst’. Ook de term ‘zelfhaat verlossing’ dragen ze hoog in het vaandel. Van bij de eerste noten is het dan ook ellende troef. Hun zelf als depressieve black metal omschreven songs doen je in een hoekje wegkruipen. De eerste paar uur kom je er niet uit. De titel van deze EP verwijst naar zwakte en het verlies of gebrek aan kracht en energie. In de psychiatrie verwijst het naar een angststoornis ook wel het syndroom van Da Costa genoemd. Het zijn beschrijvingen die je mee op weg moeten helpen om de muziek van Misery te doorgronden. Veel voegt die niet toe aan wat we doorgaans bij een black metal plaat krijgen voorgeschoteld. De zanger bedient zich van het bekende, schelle gekrijs. De gitaarriffs zijn monotoon en worden weggedrukt door een overdaad aan vervormde geluidseffecten. Het overwegend rauwe traject wordt sporadisch afgewisseld met door gewone zangstem gezongen passages en enkele meer rustige aan ambient gerelateerde fragmenten. Zoals het een echte black metal band betaamt is er van een echte productie geen sprake. Heel ‘old school’ dus. Laten we wel wezen: Wie nooit fan was van black metal zal ook door deze ‘Asthenia’ niet overtuigt worden om zich tot het genre te bekeren. Dit willen we nog kwijt: ’Asthenia’ bevat met ‘Severed’ en ‘Nerves’ slechts twee tracks. De oplage is met slechts 42 exemplaren en 3 ‘artist edition’ kopieën sterk gelimiteerd. The legacy of the Distant Voices label is resolutely quiet, even virtually unknown. I get the feeling that they would like to keep it that way. Although they’re as consistent and as hard-working as any other label in the metal underground, their hand-crafted, extremely limited-edition releases embrace the solipsist aura in depressive black metal. Including promotional materials, I don’t think they’ve ever released an album that had over a hundred copies made. It’s ironic that one of Distant Voices’s biggest selling points is that they’re committed to not selling. What would be a sabotaging gimmick in any other style makes perfect sense here. Depressive black metal would mean less with any success or spotlight. Misery is the primary project for Distant Voices project leader Thomas Bel, credited here as Fille de Misère. 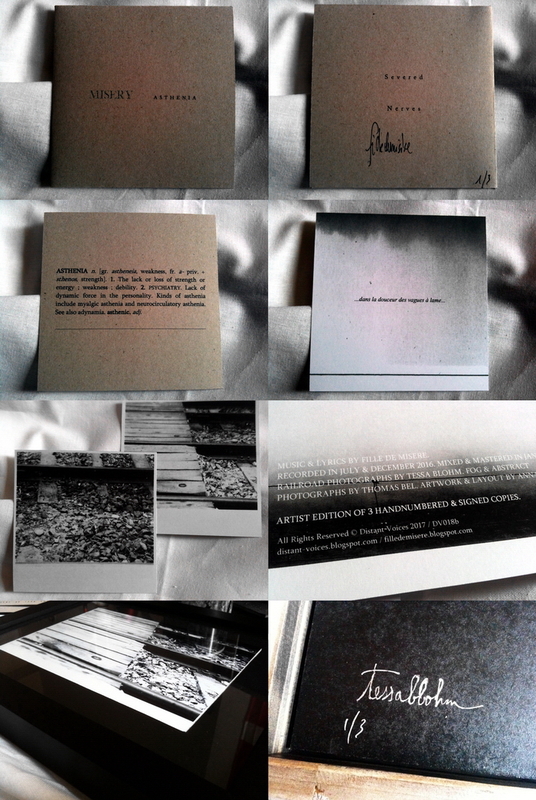 The latest EP, Asthenia, has been crafted in a very limited, forty-five copy batch. While I’ve kept relatively up-to-date with this project since first hearing the Black Crafted Elegies full-length some years back, subsequent efforts haven’t expanded on the experience at all. I knew exactly what to expect before putting on Asthenia. For what it’s worth, the two tracks here do exactly what they set out to accomplish and nothing else. 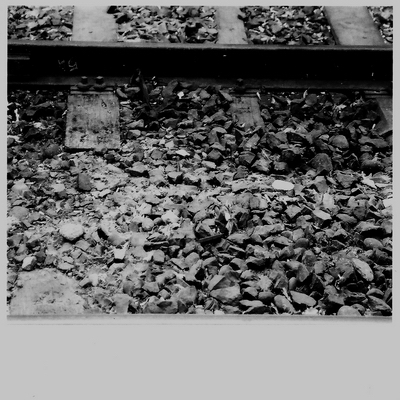 Here’s a pair of roughly ten-minute treads into the blackgazing end of raw DSBM for your muted pleasure. The title Asthenia refers to a general dearth of energy and life. In this sense, Misery delivers precisely what it promises, so there’s no way to directly criticize the EP’s lack of lustre. It’s difficult to say whether Misery’s latest orb of slogging minimalism is fully worth a recommendation. 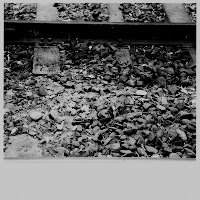 The soulsucking atmosphere and the shoegazing hints are proof of Fille de Misère’s success; Asthenia‘s droning structure and anaemic tone limit the appeal to the usual cadre of depressive lurkers. There aren’t necessarily missteps on Asthenia, but at this point, I’d expect Misery to have a handle on the formula. With only negligible differences between this and Black Crafted Elegies or 2015’s No Days to the Funeral, Asthenia feels too sleepy and derivative to feel like anything more than a needless addendum to the project’s full-lengths. 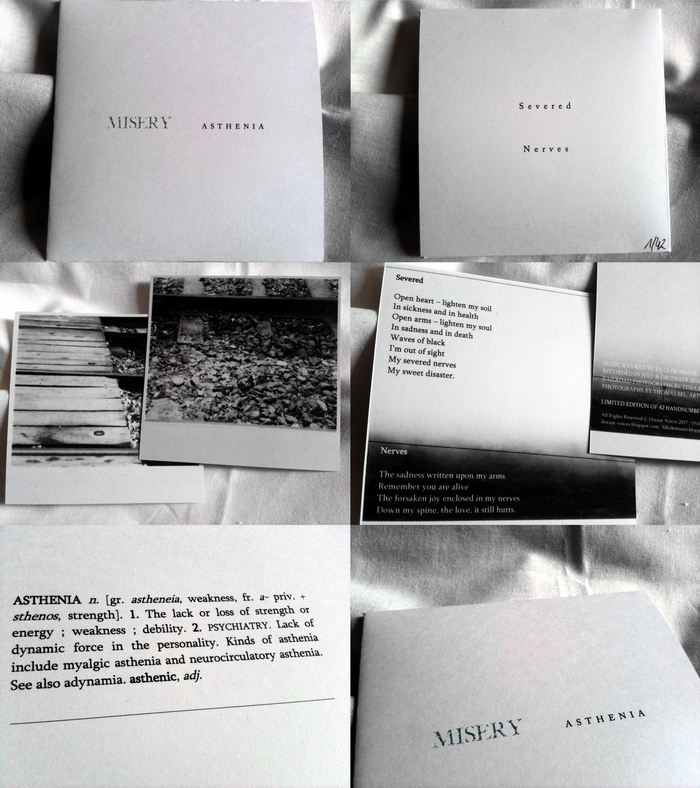 I want to recommend a new two-song EP named Asthenia by the prolific one-person French band Misery, which was released just yesterday in a very limited CD edition by the French label Distant Voices. The two tracks on the EP, “Severed” and “Nerves”, are both long ones, but they still don’t overstay their welcome. Instead, their length simply deepens the mesmerizing effect of the music. This isn’t pretty music, to be sure. It has a raw lo-fi quality, the emotional resonance of the songs is depressive, and the vocals are mainly the wrenching shrieks of a tortured soul. Yet the infectious quality of the drum propulsion and the penetrating effect of the looping melodies still manage to cast long, dark, immersive spells. Perhaps paradoxically, the music also displays vibrancy and passion despite the tear-stained mantle that cloaks it. The lead guitar and somber clean vocals of “Nerves”, in particular, fashion a kind of dark beauty within a framework of emotional collapse.